From parties to business outings to family reunions, we offer the best charter shuttle transportation in Monterey. Make your next event a special one with a Monterey Airbus charter service. Our charter shuttles are the best way to get affordable group transportation on your schedule. Call us to book an hourly charter shuttle for your next event – Call (831)-373-7777. Use a charter service for everything from sporting events to concerts, a night on the town in Monterey, holiday parties, private tours, or convention shuttles. 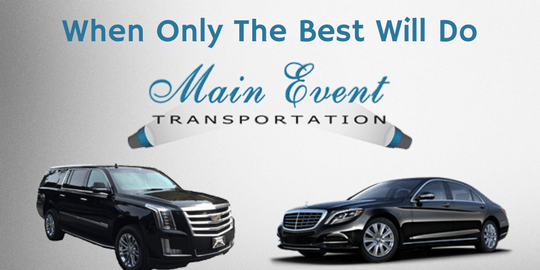 You can also reserve a selection of luxury sedans and limousines in Monterey for proms, weddings, and more at Main Event Transportation. Reserve your private shuttle in Monterey, Carmel, Pebble Beach, Pacific Grove, and Seaside. Whether you’re throwing an office party or need additional transportation to the airport throughout the holiday season, reserve a Monterey Airbus holiday shuttle today. From Thanksgiving to Christmas, we can all use a little help around the holidays. Let us help pickup or drop-off your relatives at the SFO and SJC airports. Our charter services can also be used for corporate parties. If you’re planning a company holiday party, Monterey Airbus provides safe and convenient charter transportation that is perfect for your employees and coworkers. Headed out to Monterey, Pebble Beach, or Big Sur? Don’t worry about drinking and driving with one of our private charter shuttles. Our shuttles services are perfect for bar hopping, parties, graduations, anniversaries, office parties and more. We can provide convenient group transportation in Monterey to restaurants, pubs & bars, and wineries. Our shuttles are the perfect way to mark the occasion and have a spectacular night on the town. Or book a limo with Main Event for a great bachelor/bachelorette party car service in Monterey. Get to the stadium or arena with our private shuttles! Monterey Airbus provides sporting event shuttles in Monterey to basketball, football, baseball, soccer games, and more. Our sports transportation can be used for fishing trips, golfing, or catching a game at Cal State Monterey. Our concert transportation allows you to enjoy the show without worrying about traffic, parking, directions or being late. Monterey Airbus provides convenient and friendly convention charters throughout the Monterey Bay area. Our convention and conference shuttles can be used for business or pleasure, everything from comic conventions to trade shows. Reserve a convention shuttle to the Asilomar Conference Grounds, the Monterey Conference Center, the Hyatt Regency Monterey Hotel & Spa, and more! We can also provide executive shuttles for all your business needs. Planning your own group tour in Monterey? Our customized charter service is great for any sized group! Our specialties are wine tours in Carmel Valley and private charter tours in Big Sur. Whether you’re creating a private charter tour in Monterey or sightseeing trip in Pebble Beech, reserve a private charter shuttle with Monterey Airbus. We can also provide shopping shuttles and more.